The dashboard displays your latest analysed samples, the Samples window displays all the samples that you or your group have uploaded to VarSome. You can also learn about the analysis status (e.g. running). An email will be sent to you once the analysis finishes. The Samples tab displays all the analysed samples. You can use the Search field to look for sample names, users, phenotypes or diseases. Gene list analyses or algorithmic filters are displayed as sub-analyses of the main sample. Variant list: The list of identified variants. Sample/Analysis information: A detailed description of your sample and analysis, with version information for the software and databases used. Phenotype - Disease information: Here, it is possible to add and modify the clinical description of the sample. 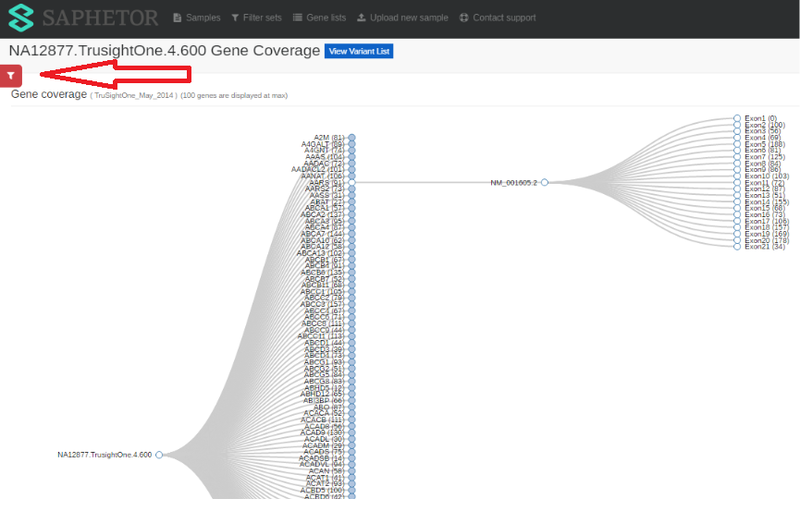 Gene Coverage: When clicking on Gene Coverage, a new window will open showing a tree with the coverage per gene. Please note that we only show information for 100 or fewer genes in this view since any more are impractical. If you wish to see coverage information for analyses with more than 100 genes, please use a gene list to limit the displayed results to 100 genes or fewer. The gene list can be selected when the new window opens by a click. If this option has been selected when analysing a gene list, the tree will contain only the genes from that gene list. Clicking on any gene will cause a tree of its transcripts to be shown which can then be expanded to a tree showing the coverage of individual exons. Clicking on an exon will open a new tab, showing the read coverage from the corresponding bam file. View QC report: A quality control report. Download QC report (docx)/Download QC report (PDF): The QC report can be downloaded in Word or PDF format. View FastQC report: A quality control report for high throughput sequence data. For more information please see the documentation of the fastqc tool. Download VCF: A compressed (*.vcf.gz) vcf file will be downloaded. Coding coverage report: Excel document containing details of the coverage of the coding regions included in the analysed gene list. Region list coverage report: Excel document containing details of the coverage of public/custom defined regions. 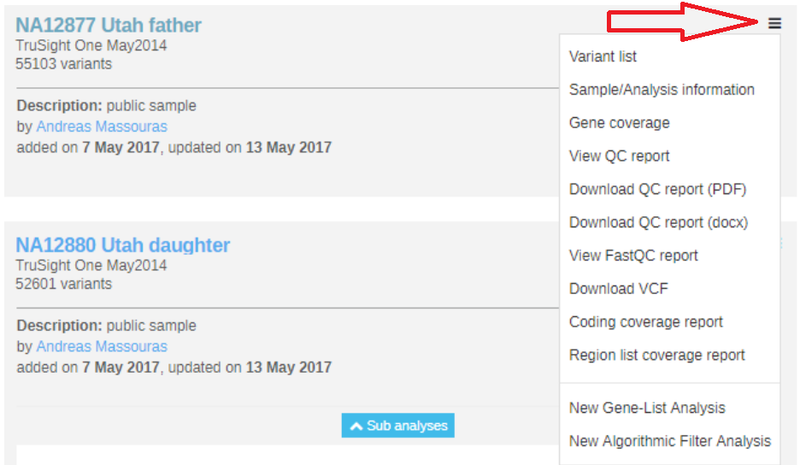 New Gene-List Analysis: This option allows you to restart the analysis using a different gene list. New algorithmic filter analysis: Opens a new screen with the available algorithmic filters. Please click on the info icon, to get a description of each filter.